Thank you for not smoking, oh wait, what? I am running behind on my blog series about Freedom Tour 2009, I am going to try to wrap it up this week. First off the posts will be much shorter, they were too long to write and too long to read. Second I am going to skip over some of the stories I tried to weave. For those waiting for the cliff hangers the thing that I saw that shocked me in CT was my fathers old van that my brother nick named Barny because it was eggplant purple, when they gave it to charity it was barely running but there it was in CT. Also we fired Michelle for a different GPS voice but they all sounded the same and all kinda stunk. When we got to RI I immediately noticed the giant bridges in Newport and how much nicer they were then the bridges we have back home. I also noticed the giant church like slot hall. When we got to Newport almost every hotel in the city was booked because of a giant tennis event because apparently Newport is the tennis capital of the world, or so said the gentleman at Motel 6. I found the room to be hilarious because it was so utilitarian and stripped of any amenities, even the tv was just plopped on a desk almost hanging off the side. 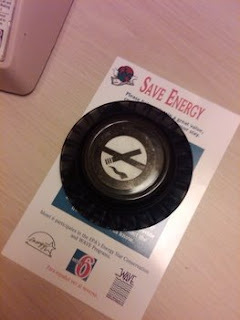 My favorite part of the room was the no smoking signs , they were conveniently placed on the bottoms of upside down ash trays, just in case you needed to catch a drag to let the fact that your in a smoke free room sink in I'm sure. Rhode Island cemeteries are huge, I mean HUGE. The Newport one was big and the Providence one would of had its own zip code under different circumstances. All the pictures in this blog are from Newport due to the more interesting things we saw down there. William Ellery was the first signer we went to visit, buried in Newport RI and apparently within a half mile of his home which was a common theme. 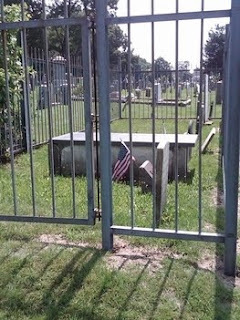 What was amazing about Mr.Ellery was the fact that his grave site is surrounded by a nine foot steel fence. Not a wrought iron fence but a recent fence , I would say less then 30 years old. Some of the signers were literally on the sides of their father in laws graves and yet Ellery gets his own fortress, its curious to say the least. I think its a sad way to spend eternity, surrounded by fence. Another curious site was this house right on the edge of the cemetery. The distance between that obelisk and the window of this home is less then 5 feet (yes I checked) and it is lined up with the window to boot. When I was younger I used to laugh at my cousin who would refuse to breath while we drove past the cemeteries in Everett and I would buy a home near a graveyard but this would be a little too much for me. Whats even weirder is they both seem to be from the same time period. At least he has a quiet neighbor I guess. After Newport we headed over to Providence to wrap up the Rhode Island leg of our trip. This was one of the biggest cemeteries I have ever seen in my life, it had its own road map and took us several minutes just to DRIVE the length of it. 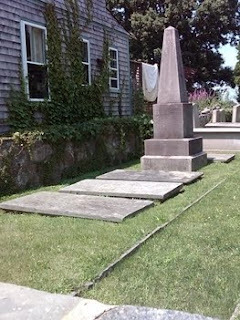 Stephen Hopkins was buried under a medium sized obelisk that luckily was already photographed on another site. We managed to use our tree identification skills to find the tree that was in the online photo. We also managed to find the site of the founder of Brown University who had his own little chapel which is currently in very rough shape. 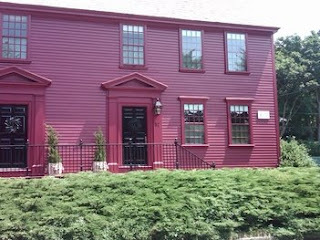 After hitting up the cemetery in Providence we headed to Brown University for lunch. Ive never been to Brown but can not understand how anybody lives there in the winter time. The gradient on the hills was so low that they had warning signs posted all over the place. In 80 degree heat it was a pain, in sleet I could imagine people losing their grip and falling to their death on the jagged ice below. Brown reminded me of a mini Harvard in the sense that their yards are very similar and the architecture looked alike as well especially when compared to the Gothic Revival of Yale. Lunch was pretty good, we went to this Greek place that was pretty good but not outstanding. The condiments were sitting in the table in their original containers, including the olive oil. Now it was not a fancy place but it sure was more done up then a diner I expected my salt to be in a shaker and my olive oil (Greek remember) to be in a container of some sort. Maybe it's just me. After several days of heat and humidity and being away from a reliable source of iced tea for so long I was getting a little cranky and the thought of tackling that hill again was putting me in a funk. That's when I saw the holy grail, Tealuxe ! I always thought that only two existed in the WHOLE WORLD. Boston and Cambridge, but low and behold here it was in Providence. First I found my fathers old car and now this, surely this was a miracle. Walking inside I immediately noticed it was larger then my local haunt in Harvard Square and the staff was larger as well. On any given day their is a tea rotation of four different teas and I was very happy to see that Golden Monkey was on tap today! Golden Monkey only shows up once a week tops and here it was, right in front of me , miles away from home. No this was no miracle, this was Providence. The day ended back in Boston where we hit up my brothers graduation party. Pool, air hockey, lots of food, beer, video games, it was a good night. Great way to end the day, I was ready to tackle New Hampshire.